WikiLeaks releases U.S. spied on three French presidents. WikiLeaks drops info on U.S. spying on France. 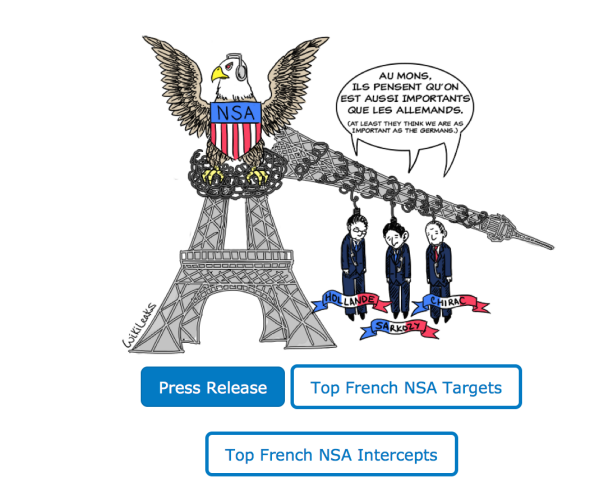 Like all good American allies, French leaders, like their German counterparts, were on the wrong end of NSA eavesdropping, a newly released cache of WikiLeaks documents finds. As you may remember, the Germans weren’t their characteristically easygoing selves when it was discovered the NSA was listening in on Chancellor Angela Merkel’s cell phone. The WikiLeaks documents show the NSA may have outdone its “German job” by spying on the last three French presidents: Jacques Chirac, Nicolas Sarkozy and Francois Hollande from at least 2006 until May 2012. The fact that the U.S. spied on top French brass is the biggest of WikiLeaks’ seemingly middling revelations. It’s certainly newsworthy, but in a post-Edward Snowden world, WikiLeaks appears to be trying (too?) hard to regain its top leaker mojo. For instance, the site’s release went to great lengths to slyly imply this, not the Merkel phone leak, is the big one! “While the German disclosures focused on the isolated fact that senior officials were targeted by U.S. intelligence, WikiLeaks’ publication today provides much greater insight into U.S. spying on its allies,” WikiLeaks writes. “The French people have a right to know that their elected government is subject to hostile surveillance from a supposed ally,” WikiLeaks founder Julian Assange said. And if they didn’t know before, now they do.